Dennes Boon was an American musician, guitarist and vocalist of The Minutemen, a Californian punk rock group. With the Sun in Aries in the 10th house a dynamic and successful career was on the cards and although his time was short, he was listed at No 89 on Rolling Stone’s all time list of greatest guitarists. 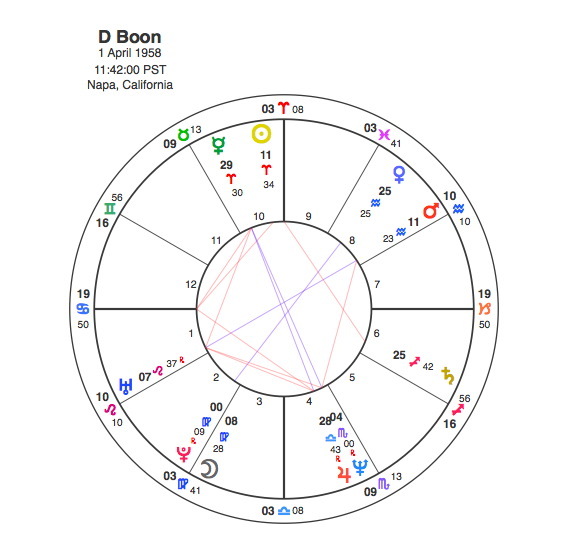 Boon began his career in 1978 when he joined The Reactionaries as Pluto was square his Ascendant. His Moon is conjunct Pluto and this conjunction is opposite Venus in the 8th house so his life would be characterised by sudden powerfully life transforming events. The biggest issue in his chart, however is a Grand Cross between Mercury, Mars, Uranus and Neptune. A Grand Cross is a very difficult aspect because four planets are pulling strongly in conflicting directions generating a great deal of tension. Central to this aspect pattern is the opposition from Mars to Uranus. This aspect is traditionally viewed as one that creates accidents. Mars is closely conjunct the 8th house so the symbolism is already pointing to accidental death. Mercury, the planet of movement is also part of the Grand Cross in the fast moving sign of Aries. Mercury is considered to be square Mars because the other aspects in the pattern draw these two closer together and this aspect points even more clearly to a driving accident. On December 22, 1985 as Pluto was moving through the Grand Cross conjunct Neptune, square Mars and Uranus and opposite Mercury, Dennes Boon was riding in the rear of a van, lying down without a seat belt because he had been sick with fever. The van went off the road and he was flung out the back door, breaking his neck and dying instantly at the age of 27. Sadly the symbolism is spot on as Neptune can easily symbolise sickness and the 4th house because its at the base of the chart can signify the back of the vehicle. Neptune is also conjunct Jupiter and the big planet’s rulership of freedom could easily suggest not been tied down by a seatbelt. Tragically Dennes Boon’s chart suggested an accident waiting to happen and like so many events that are indicated in someone’s chart the thing that triggers it is a Pluto transit.